June ended around 2C warmer than normal, the warmest June in 13 years and very dry. hundreds of forest fires are currently burning in the north. This is already leading to significantly reduced visibility and air quality issues. Sound familiar, just as we saw in 2014. 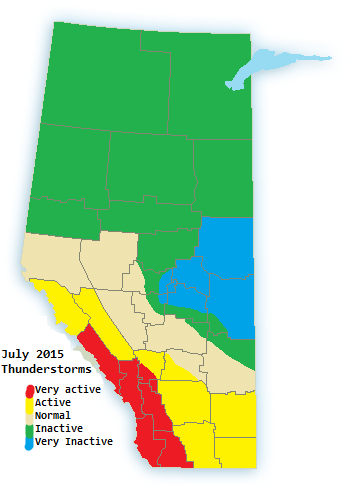 It’s even hotter this year so thunderstorm activity started at much high levels. June had a decent level of thunderstorm activity. For July I looked at various factors. El Nino, persistent ridging already present and how these ridges break down. The ridging seems to undulate in a way that prevents much for convection and moisture. Models(NAM) already show the same with the first “brief” ridging of July, heat goes away for a day or two without much moisture for thunderstorms. I’ve plotted thunderstorm activity based on this pattern, and where instability and moisture are most prevalent. Rainfall for the month of July should be very low with the exception of the southern foothills as stalled patterns should yield daily showers and thunderstorms. There is a chance some regions in the north may not receive a drop during the entire month. July 20-31:Warm to Very hot, Extremely dry. Small chance of a major severe outbreak in central and north but overall very little thunderstorm activity outside of the mountains and foothills. As drought continues to develop the chance is quickly increasing of extreme drought in parts of the province, in that case major dust storms may become a problem as we head toward late summer. Summer 2015 forecast. Question of the day is: just how hot? 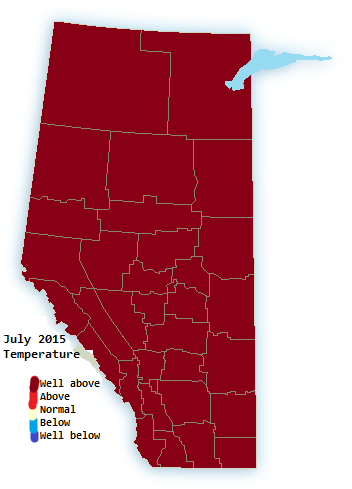 June 2015 so far is about a degree above normal. The heat is turned up enough that the cooler nights due to the low humidity are not cancelling it out. This should be the case with the summer as a whole. 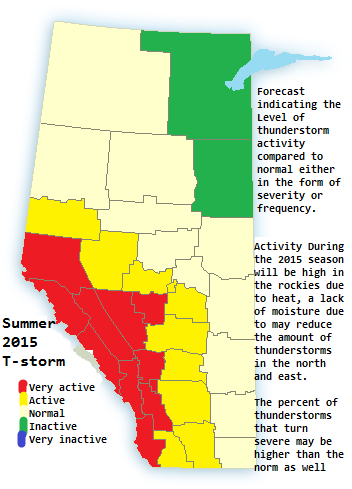 Overall Summer temperatures should be well above normal for almost the entire province. Meaning at least 2°C warmer than average. Though this translates to 3-5°C warmer highs and near to slightly warmer overnight lows. There will be plenty of 30C+ days throughout the province. The number of 35C days are also likely to be higher. July and August especially to be quite hot and there is a higher chance of summer heat dragging on well into September. July: Very hot at times, very dry. Considerably more 30°C days compared to average. Higher chance of extremes(35°C+). Thunderstorms more likely to be severe even with lower frequency. High frequency of nocturnal thunderstorms. Best chance of cooler weather in mid month. 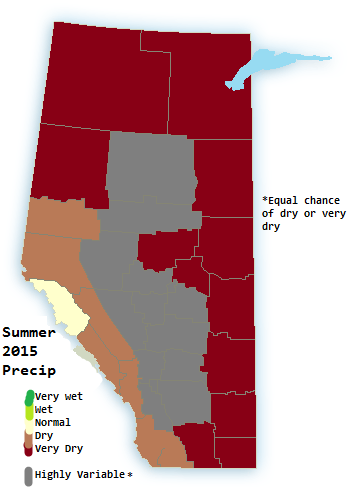 August: Hot and dry, Strings of 30°C days likely even for more central and northern parts of the province. High frequency of Nocturnal thunderstorms, some severe. Best chance of cooler weather mid to late month. September 1-15th: Warm and very dry, hot at times. higher risk of dust storms. 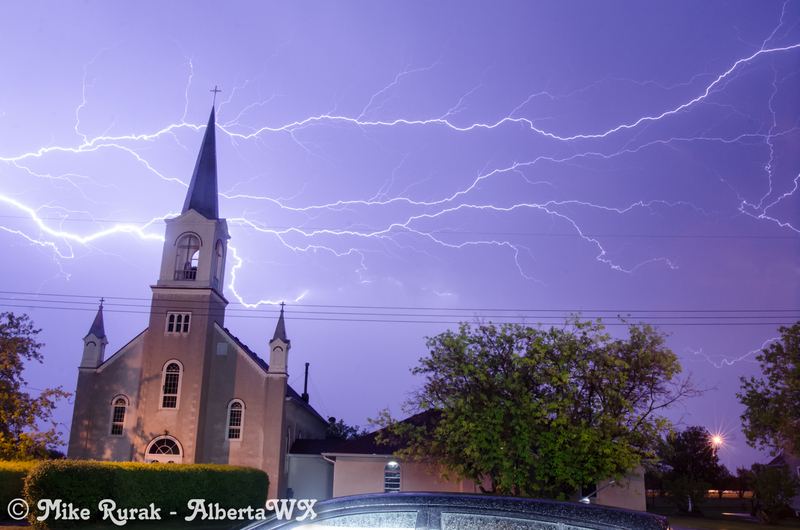 AlbertaWX North Dakota chase report. June 2-3 2015. 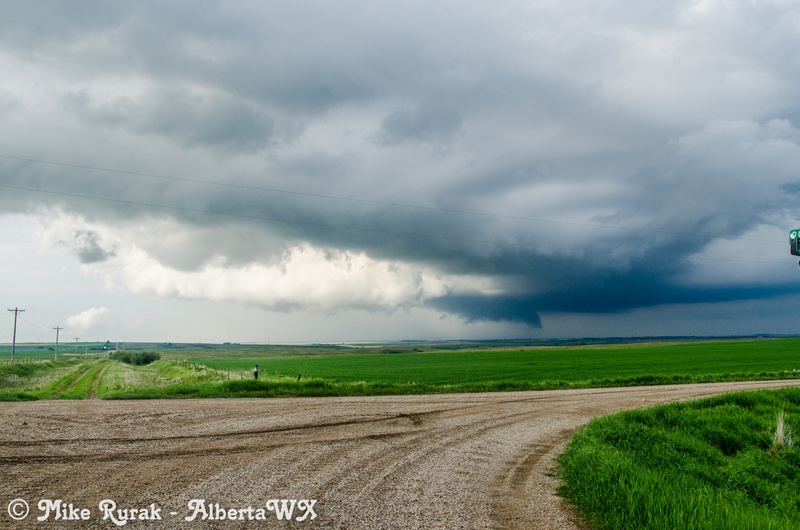 While the chase did not pan out great we still got 3 supercells so here is a summary of the 1st day of chasing. We skipped the 2nd day due to damage from a bird strike. My( Mike R) Phone got fried by the stock charger so we only had the one phone with us to do all the maps, radar, and warnings. 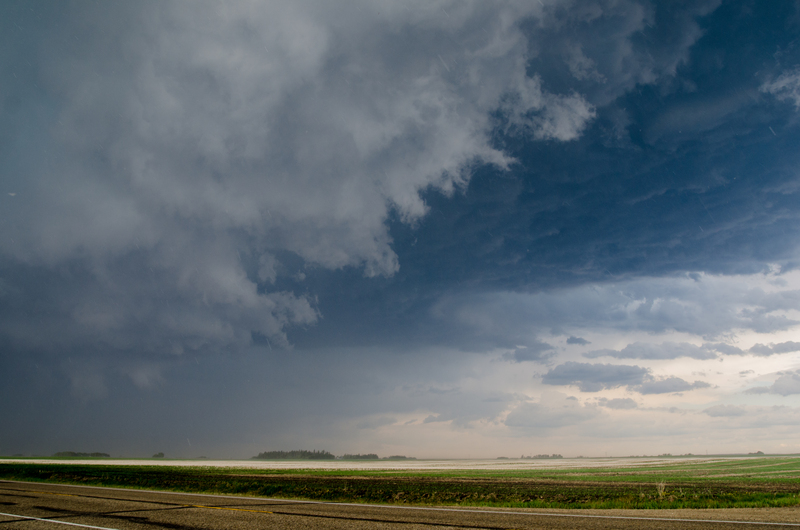 First storm was a warned supercell near Strasburg, ND. We came up to the back side and slowly followed it for about an hour until it showed signs of dying. 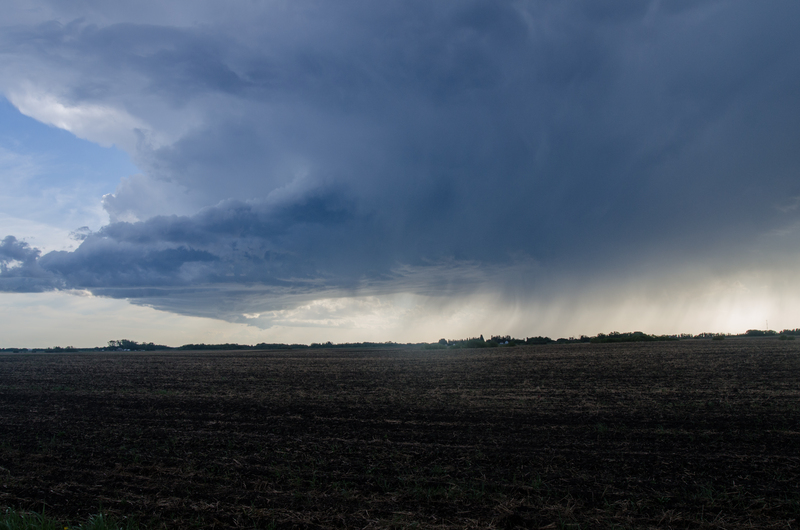 We then headed back north to I94 to check out a new storm west of Bismark ND. Just before I94 the tornado warning went out for as storm Southwest of Minot. ND. While on I94 there were too many ducks flying over the road and one of many hit the windshield to cause it to shatter. Now with it being too hard to see we had to skip photos of the 2nd supercell and seek out a repair in Bismark while the storm passed ~10 miles south. With no place open we had to back north to the hotel not before checking out the 3rd storm east of Washburn, ND. 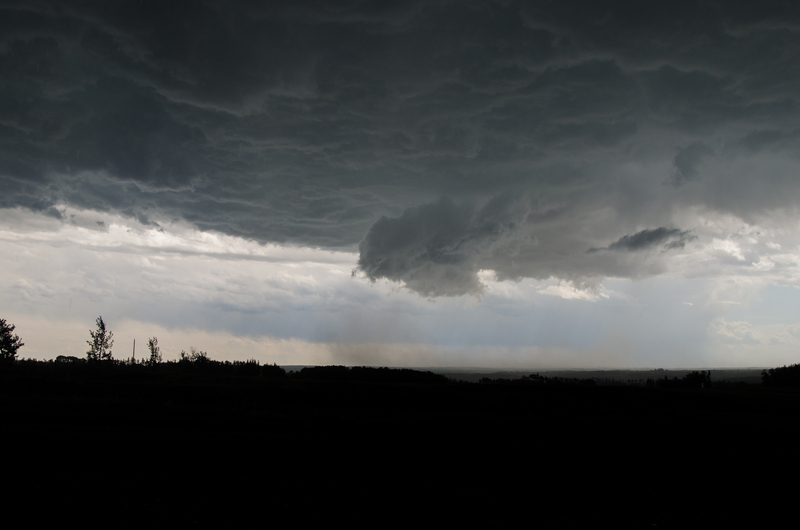 The weaker supercell was not warned but had some decent structure with it. We then headed back to base at the hotel in Minot. 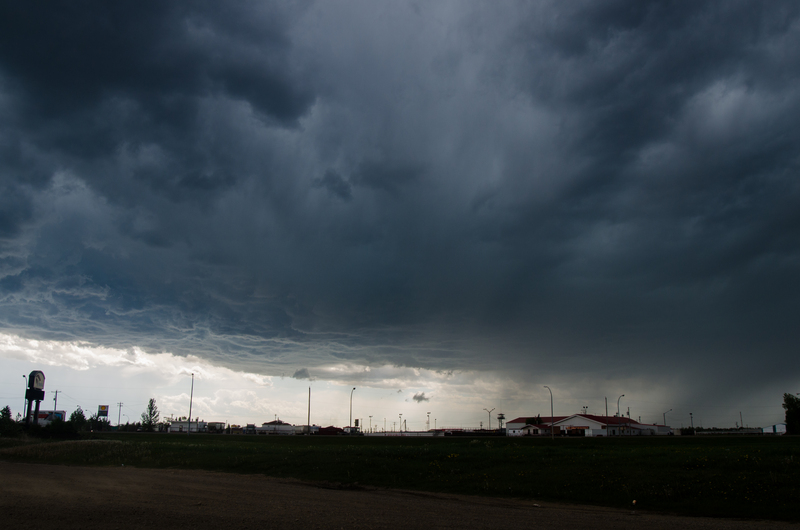 Other than an epic downpour and the odd flash of lighting Minot was spared the severe weather. Once back we ate pizza(which is incredible) and call it a night. The next day which was originally to follow the setup we were instead at the glass shop dealing with the bird strike damage. This was 2pm so we were flat out of time to make a 2nd day so we checked out the local zoo and Sonic before heading back to Alberta. Basically a bust but showing up is a milestone. Our first USA chase, Sometimes you get lucky and other times you have to go again. 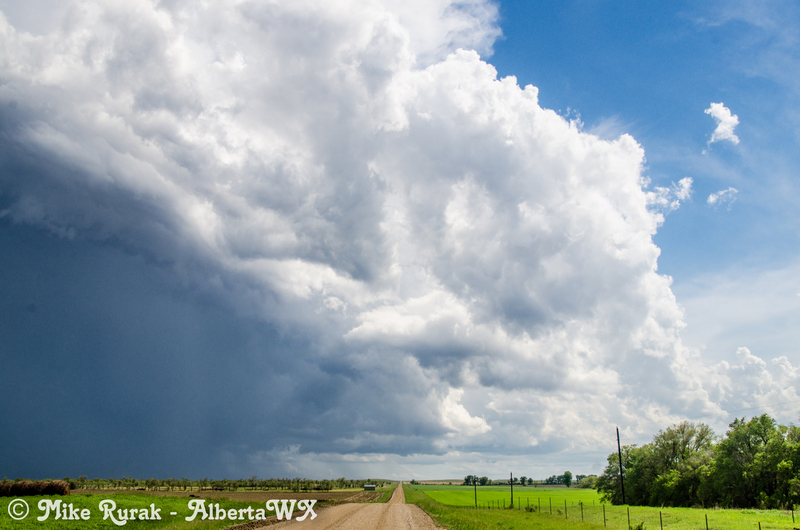 The forecast is a bit late due to the recent 2 day chase state side(a post on that to come) but here is the June 2015 forecast for Alberta, Saskatchewan, and Manitoba. 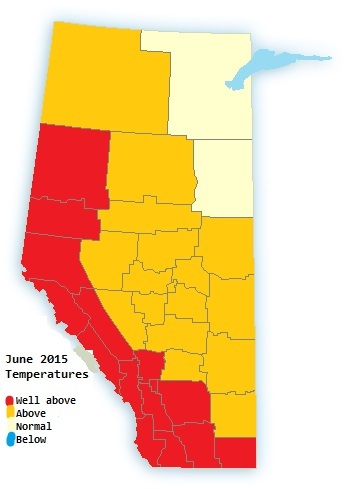 Due to drought the month of May finished off near to colder than normal over all but the NW part of Alberta, where it was much warmer than normal. Precip wise May 2015 was one of the driest in decades. The drought lead to overnight lows being 3-5C colder than normal and thus even the warmer than normal highs did not do much to cancel that out. This “cold night” regime will pay a part in the June 2015 conditions. 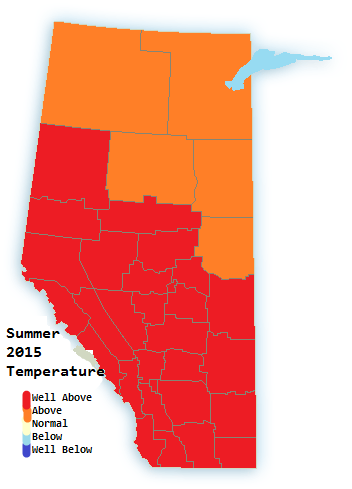 Overall near normal in the two eastern Provinces, Warmer to much warmer than normal in Alberta. These will likely be the result of very hot weather with cold nights due to the continuation of drought. Due to some gulf flow isolated areas may see more flash floods due to thunderstorms. Showers and thunderstorms look to make up roughly 95% of the rainfall. June 1-10: warm to very warm. the odd thunderstorm but otherwise very dry. 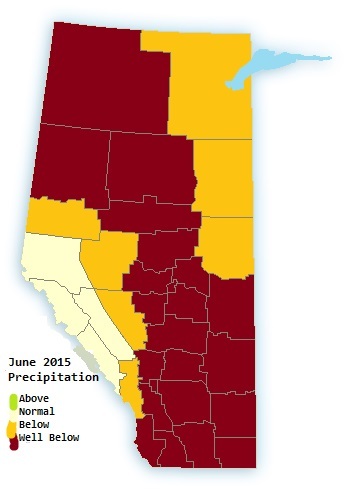 Alberta may get some decent rain, but nowhere near what is needed. 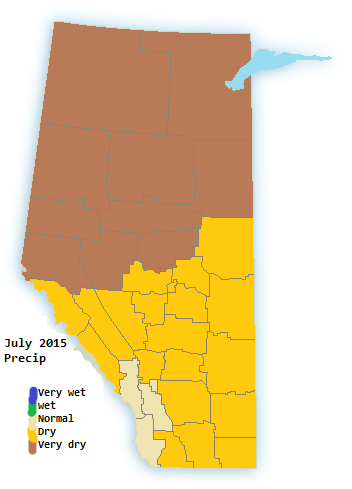 June 10-20: hot and humid briefly in southern Sask and Man. Cooler and dry in Alberta. June 20-30: Very hot at times with highs in the low to high 30s, Possibly a 40C or two getting out of BC and into Alberta. 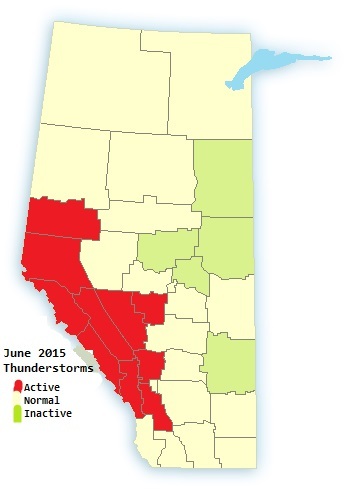 Humidity below 10% in Alberta, risk of dust storms and a return of extreme fire risk. higher humidity to the east should spark plenty of thunderstorms. 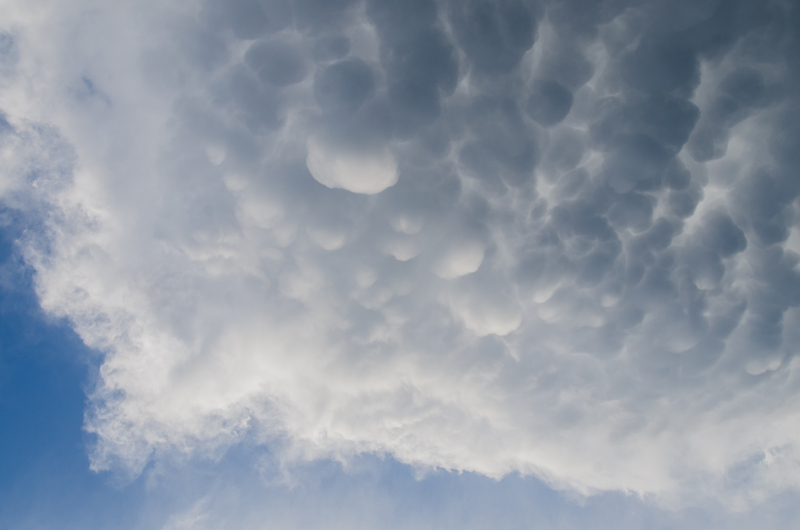 Severe thunderstorms, some super cells broke out on Sunday after a night of energetic nocturnal MSC and squall lines. 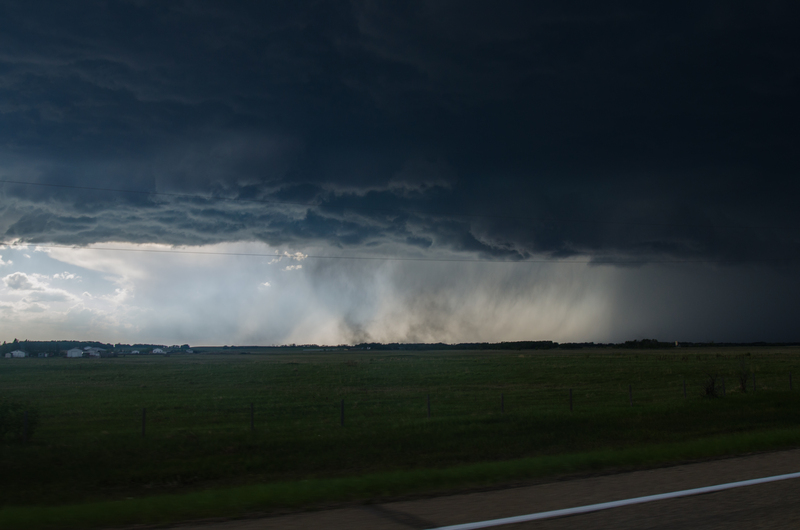 The overnight storms followed the Yellow head into the Edmonton area with frequent lightning, hail, and heavy rain. It’s the best light show I’ve seen in May since 2006. The storms continued into the morning and next day. Daytime heating later in the day fuelled another round of storms in the form of discrete supercells. Weak to moderate shear, some CAPE and weak to moderate cap sparked several discrete severe warned thunderstorms. 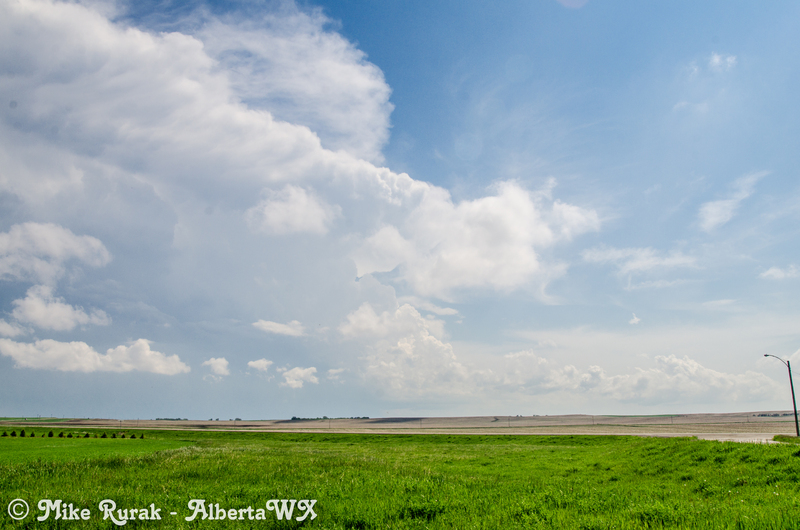 The first one formed north of Rocky and moved east toward Rimbey, Ponoka and Stettler. The 2nd(and most intense) formed near Edson and tracked into Saskatchewan through Calmar, Leduc, Wetaskiwin, and Camrsoe. By the time it reached Loydminister it had one of the best shelf clouds so far this year. Additional storms including an LP supercell that made a brief appearance from Winfeild through Maskwacis before petering out.